Each year on Drive Day, the second Saturday in December, the Charity Newsies’ Paper Sale raises thousands of dollars from generous organizations, foundations, businesses and individuals. Newsies also collect contributions through the Annual Kick-off Auction, the sale of Hearts and other fundraising activities during the year. Together all these contributions represent the Drive Total, which last year was $1,438,391. 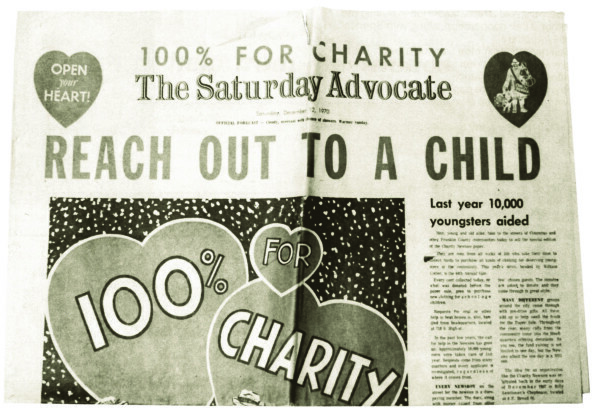 The Newsies use the slogan “one hundred percent for charity”, and in fact all funds raised from the Drive are deposited separately by the Newsies’ Treasurer into the Charity Fund and used solely for the cost of clothing the children they serve. The clothing program costs have exceeded the drive contributions for many years. Last year the cost to clothe the almost 11,500 needy school children was $1,610,000. Fortunately, the Newsies have benefitted from many generous bequests over the years and these funds have been invested to generate earnings to fund the shortfall in drive contributions so that every needy school child could be served. The administrative management and fundraising expenses of the Newsies are paid for by the annual dues from each Newsie and membership fundraising events as well as a portion of the investment earnings. When program expenses are divided by total expenses, as the Better Business Bureau calculates, 86% – 88% of all expenses are for the clothing program. That number has remained constant for the past decade as the program expenses have continued to exceed the drive contributions and more children have been served. This information is available in the Newsies’ audited annual financial statements and the Federal Form 990, Return of an Exempt Organization. The organization reports this information annually to Guidestar, the Better Business Bureau, the City of Columbus Charitable Solicitations Board, and the Ohio Attorney General.